Red Crow Mi'kmaq reservation, 1976: By government decree, every Indian child under the age of 16 must attend residential school. In the kingdom of the Crow, that means imprisonment at St. Dymphna's. That means being at the mercy of "Popper", the sadistic Indian agent who runs the school. 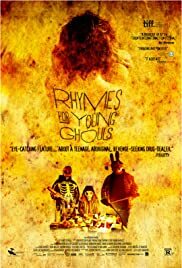 Rhymes for Young Ghouls is a difficult but very important story I believe every Canadian should watch. It poignantly captures the anger of a system that leaves one powerless; it is artful, relentless, and occasionally funny. Harsh reality blends with magical realism as the film explores themes of childhood vs. adulthood, power vs. powerlessness, and forgetting vs. remembering. As a non-Indigenous viewer I can't speak to how accurately it describes life on a reservation during the time of residential schools, but the daily challenges of the community, terrors of residential schools and relationship with the Indian Agent ring true to so many of the stories shared by elders at the Truth and Reconciliation Commission. "For me, the familiarity of the events: alcoholism leading to accidental death, suicide, incarceration, poverty, the vulnerability of having only illegal means to keep oneself and one's family safe, the brooding presence of the residential school; all of it evoked a litany of statistics that are all too real in too many indigenous communities. The absolute power of the Indian agent highlighted in this film at first seems implausible. That is, until you learn about the history of the Indian Act. The power of the Indian agent to withhold rations and blankets, resulting in the deaths of indigenous people in the late 1800's, was not lessened, but merely changed form with every Indian Act amendment, well into the late 20thcentury. At times the writing and scene transitions are a little rough, but it seems to work with the rough storyline and the incredible acting more than makes up for it. I would recommend this film to all Canadians- it is neither resoundingly hopeful or hopeless, but a haunting telling of Canada's seldom-told history.